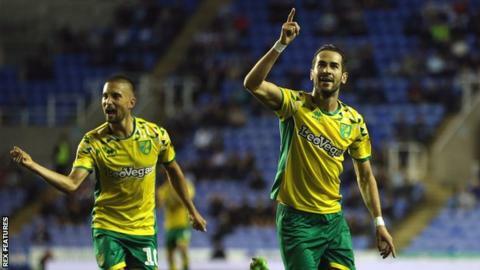 Norwich City registered back-to-back league victories for the first time this season as they won at Championship strugglers Reading. Finland international Teemu Pukki latched on to Todd Cantwell's through ball to slot home his fourth league goal of the season and put the Canaries ahead with 14 minutes gone. Substitute Jon Dadi Bodvarsson equalised from close range soon after Sam Baldock jabbed an effort onto the upright. However, the Royals were only level for a minute before Mario Vrancic showed composure to restore Norwich's lead with a precise low strike. Daniel Farke's side comfortably held on to record their first away league win since January as they consigned Reading to a fourth home defeat of the season. The Royals had registered their first league success of the season at Preston on Saturday but boos rang out at the full-time whistle at the Madejski Stadium, with Paul Clement's side the only club in the division yet to pick up a point at home. The hosts rarely threatened Tim Krul in the Norwich goal, although the Dutchman had to turn a powerful shot from Yakou Meite behind for a corner just after the half-hour mark. Vrancic almost extended Norwich's lead late on but Sam Walker saved his effort from point-blank range. Norwich had gone 11 games without an away win in the Championship, a run stretching back to their victory at Brentford on 27 January, but their three-point haul in Berkshire stretches their unbeaten run to three games. "It was a very frustrating evening after the win at Preston gave us a boost coming into the game. "The home form has not been good but we were so slow out of the traps, and on a fundamental level we were getting so many things wrong. "The attitude and commitment wasn't right but there was a good response at the start of the second half and we pinned them back. "It was absolute naivety to let them get back into it so quickly. We have shot ourselves in the foot." "I am really proud of this win and how we handled the situation, with injuries to important players. "We always look like we can score and it is a sign of our quality this season. I think it is a well deserved win as we had more chance. "We spoke at the beginning of the season that we need each and every player and a great togetherness, and the spirit at the moment is proof of that." Match ends, Reading 1, Norwich City 2. Second Half ends, Reading 1, Norwich City 2. Attempt missed. John Swift (Reading) right footed shot from outside the box misses to the left. Assisted by Josh Sims. Alexander Tettey (Norwich City) is shown the yellow card. Hand ball by Tom Trybull (Norwich City). Corner, Norwich City. Conceded by John Swift. John Swift (Reading) wins a free kick on the right wing. Attempt missed. Maximillian Aarons (Norwich City) right footed shot from outside the box misses to the left. Attempt blocked. Todd Cantwell (Norwich City) right footed shot from the left side of the box is blocked. Assisted by Mario Vrancic. Corner, Norwich City. Conceded by Sam Walker. Attempt saved. Mario Vrancic (Norwich City) left footed shot from the left side of the box is saved in the bottom left corner. Assisted by Tom Trybull. Attempt blocked. Andy Yiadom (Reading) right footed shot from outside the box is blocked. Assisted by Josh Sims. Attempt blocked. Sam Baldock (Reading) right footed shot from the left side of the box is blocked. Assisted by Modou Barrow. Attempt missed. Leandro Bacuna (Reading) left footed shot from outside the box is too high. Corner, Norwich City. Conceded by Andy Yiadom. Mario Vrancic (Norwich City) is shown the yellow card for a bad foul. Substitution, Norwich City. Tom Trybull replaces Moritz Leitner. Goal! Reading 1, Norwich City 2. Mario Vrancic (Norwich City) left footed shot from the left side of the box to the bottom right corner. Goal! Reading 1, Norwich City 1. Jón Dadi Bödvarsson (Reading) left footed shot from very close range to the bottom left corner.